Several years ago I posted an article about the old wedding tradition of “something old, something new, something borrowed, something blue and a sixpence for the shoe”. The exact origin of the Old English rhyme is unknown but the custom can be traced back to the Victorian era. Usually the items are given by the bridal couple’s family and friends or more recently the modern bride will collect some of these items herself. This is a perfect opportunity to add special meaning to a wedding and the items used should be personal and sentimental to the bride and groom. In this post, I created special decorative boxes that could be used to present the items in a beautiful way. 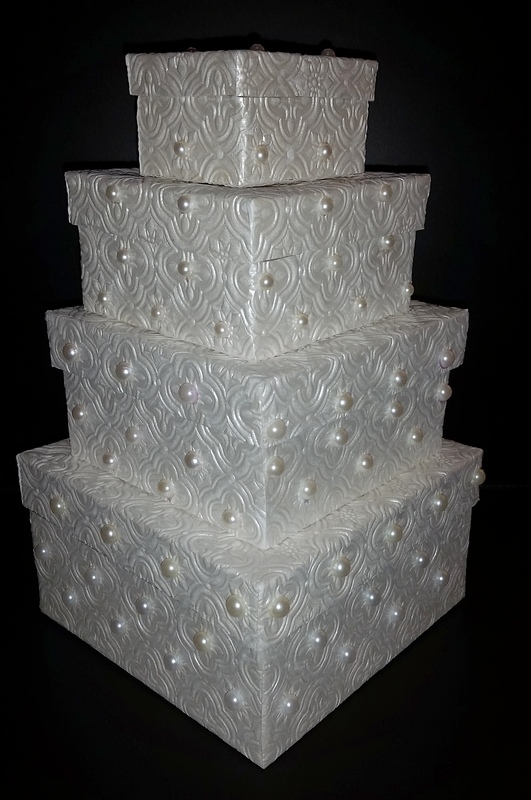 The previous Craft Post, Decorated Wooden Gift Boxes, are very similar in design and construction to the Bridal Gift Boxes but a set of paper mache stacking boxes are used instead of a wooden box. To make the Bridal Gift Boxes I have included a list of the supplies needed and complete instructions. Then at the end of the post, I will also discuss the meaning of each item from the old wedding tradition and offer suggestions and choices for selecting each item to give to the bridal couple. I found the paper mache boxes at a local craft store, the boxes came in a set of three so I had to add a fourth smaller bow. I liked them because the boxes could be stacked with the largest on the bottom and the smallest on top which would resemble a wedding cake. 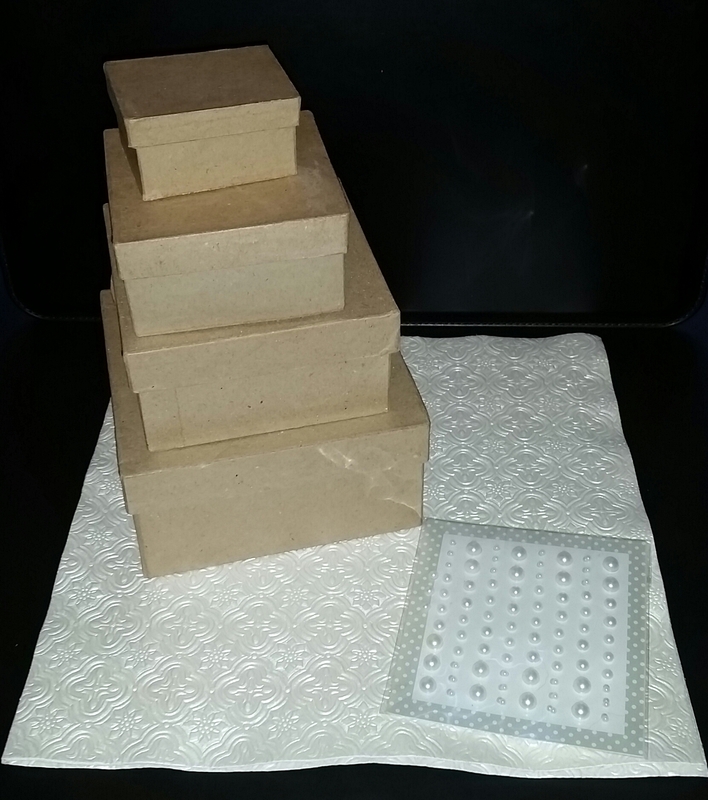 The embossed and textured scrapbook paper I selected also mimics the frosting of a wedding cake and the self-stick pearls seemed like the perfect touch. Measure the side of the box and then the bottom of the box to determine the size of the scrapbook paper. Set the paper face down, place the box on the top and cut a diagonal slit at each of the four corners. Glue the bottom of the box and attach the paper. 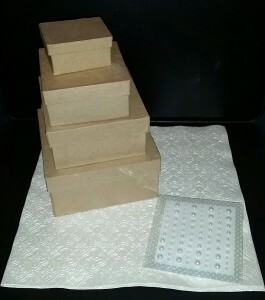 Fold the paper onto the sides of the box and glue in place, trimming the excess. Repeat the same procedures to paper the top (lid) of the box. 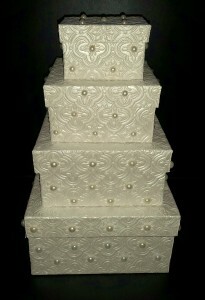 To finish the boxes, add pearls (or crystals) to the sides. To start the gift presentation at the bridal shower or luncheon, explain the tradition of why the items are collected for a bride on her wedding day and what the meaning of each item represents. Then, I would suggest that each item should be opened individually. To make the presentation more meaningful, explain the story behind why that particular item was chosen which I think would be very interesting for the bride and the guests to hear. “Something old” represents a past link to the bride’s life or her family. This is probably the easiest item of the four to acquire; usually a mother or a grandmother of the bride or the groom will have a special piece of jewelry that can be passed down from one generation to the next. Sentimental items can be a first communion cross, a pearl necklace from the mother or a special locket from a grandmother, other pieces of jewelry could be a bracelet, earrings or a necklace. An old rosary or an antique handkerchief or perhaps a button from an old suit of the bride’s father which can be sown into the bridal dress, or a piece of fabric from an old dress of the bride, mother or grandmother can be wrapped around the bridal bouquet are other ideas for something old. “Something new” represents a hope for the future of the bride and the groom on the occasion of their marriage. The obvious choice for most brides will be her wedding dress, headpiece or shoes. Perhaps the bride’s future husband will have purchased a special piece of jewelry to mark their wedding, such as a pair of earrings, necklace or a charm bracelet with a special charm for the wedding day. Another suggestion for something new could be simply a new bottle of a special perfume. “Something borrowed” is traditionally an item that comes from a happily married woman who is letting the bride borrow some of her martial success. The borrowed item could be something as sentimental as a wedding dress or veil that was worn by a parent or grandparent. Another idea could be a piece of jewelry loaned from a family member, a parent, grandparent or even a great grandparent. The important thing to remember is that the something borrowed needs to be returned after the wedding. “Something blue” represents fidelity and loyalty; this item can be a fun way to express the bride’s personality or her quirky sense of humor. This item can be something that is hidden from sight or it can be used as a bold fashion statement of the bride’s style. Traditionally, this item is usually a blue garter decorated with blue ribbon and white lace. Another traditional idea is blue-stone jewelry, such as: sapphire, aquamarine or tanzanite. A fun idea which is now popular with the modern bride are blue shoes or blue nail polish on her toes! The last optional item is the sixpence which represents good fortune and prosperity for the bridal couple. The sixpence is traditionally an item carried by British brides and it is placed in the bride’s left shoe. Today’s modern brides can have a sixpence or another special coin sewn into the hem of her bridal gown or she can carry it in the purse used on her wedding day.